Prior to 1929 the Ojai Valley fire protection was left somewhat to chance and the generosity of impromptu volunteers. Of course, the northern borders were watched over by the rangers of the Los Padres Forest. It is to one of the forest rangers who was to become Ojai’s first professional fire fighter, William Bowie, that we owe most of the information for this story. In 1925 the growth of the area outside of Ventura city was such that the county decided to form fire districts for unincorporated areas and invited any incorporated city to join. Ojai voted to do so. Each district had one commissioner. Berkeley Brandt, one of the many easterners who came to Ojai, was the first commissioner. (Berkeley Brandt, also a noted architect, designed the firehouse.) He resided in the East End of the valley where he was a citrus grower. In 1925 the volunteer firemen were : Fred Linder, Chief, Lawrence Shaw, Assistant Chief, Art Sacherer, Secretary, Sam Hudiburg, Clarence Lindnerm, Gene Mitchell, Herb Miller, Tommy Lopez, Guy Cruickshank, Cecil Little, Ken Ayers, Nelson Cota, George Noble, Joe Misbeek, Leon Munger, Bert Griffen and Stan Bunce. In the forties they were: Martin Kosub, Harold Rice, Guy Stetson, Jr., Alvin Kosub, Rudy Lopez, Arla Harris, Henry Lawrence, Jim Gallio, Reg Bunce, Fred Phiffer, and George Schroff. Volunteer firemen are still used in Ojai (1970s). Even after professional crews took over, the County continued the volunteer concept. Under the plan an individual applies as a volunteer and is required to attend classes in fire suppression. In the old days when the siren went off volunteers who were available responded from their businesses and went to the station where instructions were found on the black board. There was no compensation in the beginning for these services. About 1932 the volunteer was paid an hourly rate. This is still the basic program, but they are now contacted by walkie talkie radio. Among the early professional firemen were: Joe Misbeek, Billy Lonsdale, Frank Keys, and Tommy Lopez. There was also an honorary fire department. Some of the members were: Sherman Thacher, W.C. Hendrickson, Halleck Laffets, L.A. Peasley, Frank Barrington, C.V. Miller, Boyd Gabbert, F.H. Pirkins, Ernest Clark, George Sacherer, G.H. Hickey, Carl M. Yant, E.E. Kennison, William Phillips, and Cecil Little. The first fire station was on the east bank of Stewart Wash (which now runs under Ojai Avenue just east of the Bank of America). The equipment consisted of a 1917 Model T Ford. Mounted on the car were two twenty-gallon chemical tanks. The Boyd Club occupied the present site of the Bank of America (now a collection of shops on Ojai Ave). The chief lived on the first floor of the club. He took calls for the police at night. The siren was on the roof of the City Hall across Ojai Avenue in the Arcade mounted on a steel windmill tower. In July 1926 the volunteer fire department contracted for an American La France fire engine type 99 with a Buick motor and a one hundred gallon booster pump at a cost of $5,975. When the Ojai Fire District was organized it assumed $4,000 of the debt. The engine was delivered in December, 1928. The truck had a five hundred gallon per minute pump; a 125 gallon water tank with 500 feet of two and one half inch hose; 200 feet of one-inch hose. The down payment was raised by the volunteers and civic leaders and the fire district paid the balance. During this expansion period the charter honorary members played an active part. They were Berkeley Brandt, Hallet Lefferts, W.C. Hendrickson, Fred Barrington, C.V. Miller, Boyd Gabbert, F.H. Perkins, Ernest Clark, George Sacherer, G.H. Hickey, Carl M. Yant, E.C. McKennison, William Phillips, and Philip Pierpont. A bell took the place of a siren and was placed in the belfry of the post office. During the day the caretaker of nearby Boyd Center took calls when the chief was out on firework of the district. In 1936 the department was credited with helping to fight the Ventura Wharf and Warehouse Company fire. By this time the department had additional equipment in the form of a one and one half ton Dodge truck with a 300 gallon water tank and hose on the body. The pump was driven by a chain link from a power take off from the drive shaft. On October 25, 1939, the fire department was put to the acid test. 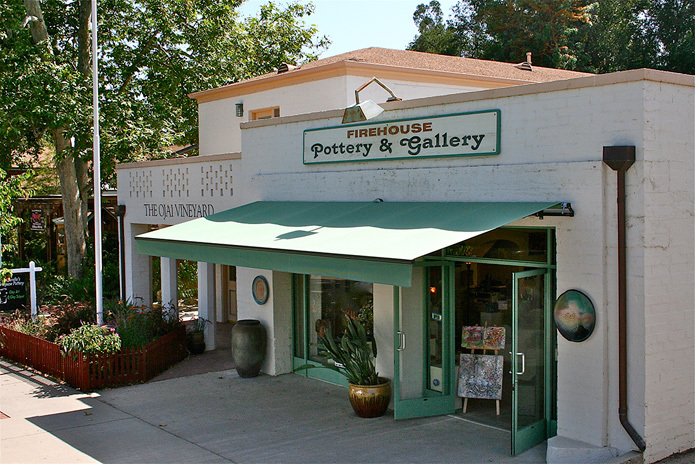 A fire started in the building housing the Ojai Publishing Company in the Arcade. The entire block was immediately endangered. Very quickly Fire Warden William Bowie was on the scene with Fire Chief Fred Linder in charge of the volunteers. Equipment from Ventura and Santa Paula was called in. In November of that year the City Council passed a resolution commending Bowie, Linder, and the volunteers for saving the downtown. There were two platoons of volunteer firemen, each of about fifteen men. One was on call for downtown Ojai and one for the outlying areas. In the absence of radio communication one volunteer drove between the two crews during a fire alert to keep each informed. Later a portable radio system was used that could send messages but not receive them. One of the major problems of the pioneer fire department was the numerous water companies with different size pipes, hydrants, etc. One, the American States Water Company, that serviced the City, had fire hydrants. The Libbey Water Company supplied the new subdivision, the Arbolada and the new Country Club. Senior Canyon Water Company supplied the East End. The Ojai Improvement Company piped water from Fox Canyon near Gridley Canyon to the hotel and homes on Foothill Road. Siete Robles Water Company supplied East Ojai Avenue. Meiners Oaks had their own system as did the Creek Road area. Oak View had two suppliers. None of these had fire hydrants in the early days. Even in the case of the American States Water Company the pipes would sometimes break in several places when under stress. When the Libbey Water Company was laying a new and larger main from their wells on Grand Avenue to the Arbolada, the fire department laid a connecting line which greatly improved the downtown situation and reduced fire insurance premiums. In cases where the capacity of the water lines was in question as to the amount of pumping pressure that might be exerted, the hydrants or outlets were painted different colors and the colored chart was carried on the truck indicating which ones could be used for pumping. This is still a necessity to determine the flow of the system. As the years advanced the Fire Department took on fire prevention tasks and ordered safety measures at Nordhoff High, Monica Ros School, Ojai Valley School, and Oak View Elementary. The theater was also inspected and safety measures ordered. An arson unit was also at work which consisted mainly of the Chief. During World War II the Ojai fire department in cooperation with Ojai Red Cross and its chairman, Dr. Tippett, taught first aid. A total of 385 citizens participated. During this period the department invested in a resuscitator, inhalator, and aspirator. The resuscitator was donated by the Ojai Valley Woman’s Club. Harmon Vaughn, who had purchased the bakery from the Baker family, gave the department a Model A delivery truck. It was painted red with two white crosses on each side and a sort of ambulance became part of the department’s equipment. The materials for the “ambulance” were again a gift of the Ojai Valley Woman’s Club and cost $413. Citizen William Mays donated a portable generator plant at a cost of $150. 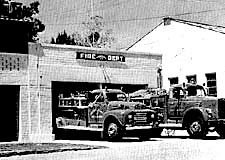 Ojai’s first firehouse was located on Ojai Avenue, where Danski is now. By 1935 the Ojai Avenue fire station was outgrowing its space. A new site was decided on South Montgomery Street, which had been, from 1894, the former location of the George Thacher Memorial Library. Part of the site was bought by a committee of valley citizens headed by Dr. Charles Butler which was destined to be the home of the Ojai Valley Art Center. The space north of that was bought by the fire district and was to be the home of the fire department until 1979. On January 30, 1936, The Ojai reported that construction was started by a contractor from Santa Paula and a crew of WPA workmen from Meiners Oaks and Oak View working on the foundation. But in March,The Ojai reported again that only 30 hours of WPA labor per week was available. In the same article we read, “that the new building will be constructed from cement blocks and provide space for two engines in the large one-story section and in the two-story section side will have an office, nose room, dormitory and storage space for the fire ladders. Upstairs will be living quarters for the County Deputy Fire Warden in charge here–in this case William Bowie and family. The structure will be finished in a white coating of cement and whitewash giving an effect similar to that of the high school (now Matilija Jr. High School). The Ojai Garden Club was active in those days. The Ojai tells us that the Club received the cooperation of the county fire authorities in a move to keep the poles off the Santa Paula grade. The poles carried a private telephone line from Santa Paula to the new station. Ojai was not to be denied their new firehouse. Ventura County decided to go it alone. A carpenter was hired to build cabinets and install the sinks. The Fire Warden suddenly became the prime mover in completing the building project along with the aid of his staff. It was not until 1939 that the roof was put over the small porch in the front of the building, which became a bedroom. The “new” cement brick firehouse on South Montgomery St.
By September 17, 1936, the move into the new building was eminent. The Ojai of that date wrote: “When the new quarters for the Ojai branch of the Ventura County Fire Department on Montgomery Street are completed, the fire boys plan to hold an open house and dance. The public will be invited to inspect the building. “The large garage, with overhead doors at both ends, will take care of four cars: the two fire-fighting units now housed in the old firehouse, a light pickup, and Deputy Fire Warden Bill Bowie’s personal car. “Adjoining the garage is a large office, which will have new desks and equipment, and in the rear a dormitory for additional firemen, with modern showers. The entire upper floor above the offices will be an apartment for Mr. Bowie and his family with kitchen, bath, bedroom and living room, and with stairs in the front and rear and a passageway leading to the large Â sun deck above the garage. The grounds in front will be landscaped. A driveway along the south side will lead to a a turn around in the rear, where there will be an area of lawn. A weather box is to be erected here, where an official thermometer, barometer, and other instruments will be located. No further articles appeared in The Ojai about the opening. However, we do read in a news release of December 17, 1936, that the City Council voted to let the Boy Scouts use the old firehouse for a meeting. Apparently the move was made to South Montgomery in late 1936 or early 1937. My father was a volunteer billy Thomas and when I turned 18 I to became a volunteer. Remember my first call and grabbed the first set of turn outs and jumped on the back. Was so excited almost fell off. It was a structure fire east end when we arrived we found out it was a false alarm. There were some reporters asking me what was going on then the captain came over and said thanks for taking all the questions from the paper and when I asked why me he said next time I grab turn outs to not grab the chief gear. Nice article, Craig! I attended kindergarten and part of first-grade at Ojai Elementary School which now houses the Ojai Unified School District offices. I can’t recall if I was in kindergarten or first-grade, but I know that my class walked from the school to the firehouse that was on S. Montgomery Street. The firemen that were stationed there gave us a tour of the firehouse and showed us the fire-engines. This was probably in about 1956 to 1957. I live a beautiful Arts and Crafts home built by Berkley Brandt in the Edgewater area of Chicago. It was built in 1906. I am anxious to learn as much as possible about Berkeley Brandt.